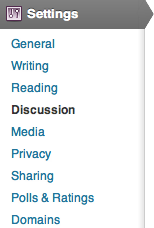 The Discussion Settings are used to control how visitors and other blogs interact with your site. In the Default article settings, there are three options. These settings are defaults for new posts or pages, which can always be changed individually on each article. This first two options deal with pingbacks and trackbacks. Please note that these options are disabled across all sites to prevent spam. The third option allows you to enable or disable comments by default. Other comment settings has quite a few options, so lets explain them one at a time. Comment author must fill out name and e-mail – When this setting is on, anyone leaving a comment will be forced to leave a name and email address. If the setting is off, visitors can leave anonymous comments. Users must be registered and logged in to comment – If this box is checked, only logged in users will be allowed to leave comments. If it is not checked, any visitor can leave a comment. Please note that this setting may not be changed on any site within our network. Also note that any Temple University user may login, but outside users cannot create accounts at this time. Automatically close comments on articles older than __ days – This setting can be used to have comments closed on articles that are X days old. As an example, if you only want articles to accept comments for 30 days you would check the box and type 30 into the text field. Enable threaded (nested) comments __ levels deep– Turn on this option to allow visitors to reply to other comments inline/nested. When turned on it can allow for better discussions and responses. We suggest using a maximum of 3 levels deep. Anything higher and the theme layouts may not work as expected. Note: Enabling the setting only applies to new comments since existing comments don’t have any threading date. However, disabling this setting applies to all comments. Break comments into pages with __ comments per page and the __ page displayed by default – If your posts/pages get a lot of comments, you may want to split the comments into pages. You can choose how many top level comments (nested comments are not counted and will not be split between two pages) to show for each page. You can also choose which page to show by default when a visitor first views the comments. Comments should be displayed with the __ comments at the top of each page – This setting allows you to reverse the order of comments. You can display comments in ascending or descending order. The E-mail me whenever options control when you get notified about new comments. Learn more about email notifications here. Before a comment appears has two different settings. If the first setting is checked, all comments will go into moderation and they will need to be approved by an administrator before appearing on the blog. If the second option is checked, any visitors that have had a comment approved on the blog in the past will get a free pass through approval and only comments from new visitors will go into moderation. Comment Moderation has two different options. Hold a comment in the queue if it contains __ or more links – A lot of spam comments include a large number of hyperlinks. The default setting here is 2 but you can make this higher or lower. If you set this to 0, all comments will be held in moderation, which would be the same as checking An administrator must always approve the comment in the previous area. The large box that is next is an area where you can type in characters to match in comments. You would type in one series of characters per line. If one of those lines match something anywhere in the comment’s content, name, URL, e-mail, or IP, the comment will be held in the moderation queue. As an example, if one of the lines contained “go”, any comments with the words “google”, “bongo” and “go” would be held in moderation. Basically if the letter “g” is followed by the letter “o” anywhere in the comment, it will match. This section of the Discussion Settings determines how avatars will be displayed on the blog. Avatar Display lets you turn avatars on or off for your blog. The Gravatar Hovercards setting will allow your readers to view other users’ profiles by mousing over their Gravatars. The Maximum Rating setting is only used when a comment author’s Gravatar is displayed. If you want to limit the maturity level of an avatar, you can change this setting. 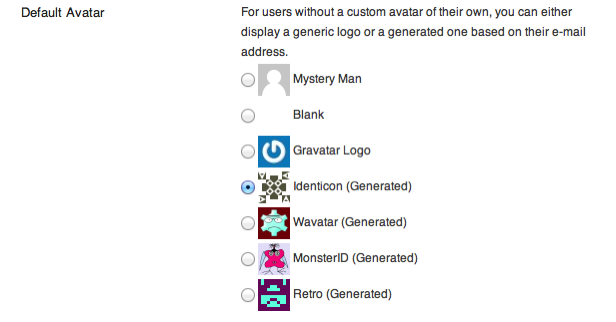 Default Avatar can be used to pick a generic logo or a computer generated avatar for users that don’t have their own custom avatar. If a user comments on your blog but doesn’t have a WordPress.com avatar or an email address associated with Gravatar, this is the avatar that will be shown.